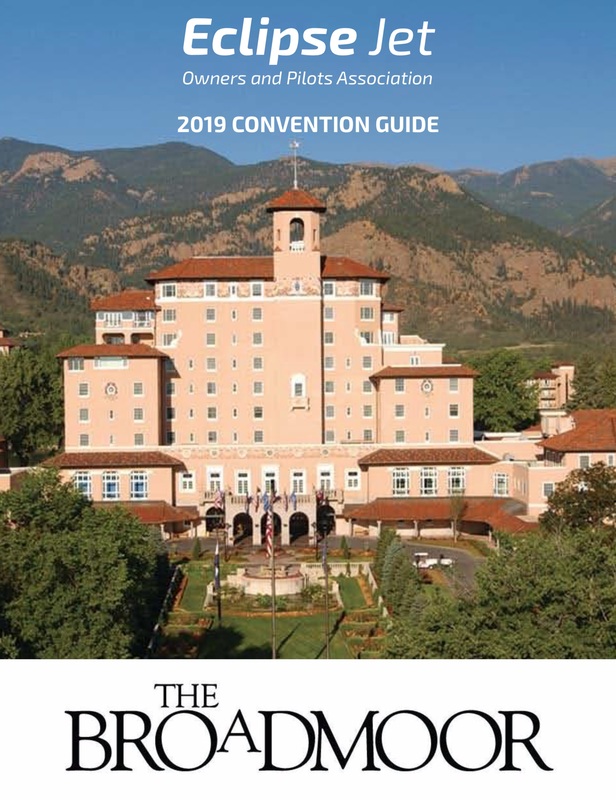 EJOPA 2019 Convention - Colorado Springs, CO May 1st-5th - Registration is open! We are excited to announce that registration is now open for the EJOPA 2019 Convention, which will be held May 1st-5th in Colorado Springs, CO. Whether you are a longtime member or someone researching stepping up to an Eclipse, come join us for educational seminars and to meet new and old friends! Three nights of special dinners and receptions are planned during the event. On Wednesday night a welcome reception will be hosted at the hotel. Thursday evening guests will take the bus ride for cocktails and dinner at Broadmoor's premier outdoor venue, the rustic yet elegant Cheyenne Mountain Lodge. Friday night dinner features our popular live auction and gives everyone a chance to socialize. Saturday night dinner is on your own. The Broadmoor has multiple restaurants, or you can explore the spectacular local cuisine in Colorado Springs. If you plan on bringing a non-flying companion, on Thursday we will be offering a leisurely one-hour walking tour of Cheyenne Canyon. And sign up for the Friday afternoon 1-1/2 hour walking tour of the historical Broadmoor complex. EJOPA will be offering a get-acquainted luncheon on Thursday. We will also be offering the Eclipse Companion Training ground school and in-aircraft training in your plane. Having two people onboard who can fly, operate, and land the plane is a big bonus for safety. Norton Aviation will again be offering a companion training classroom session customized to the Eclipse. The focus will be the cockpit in general and the autopilot specifically. In addition to the ground school, they will be offering a 1.5 hour flying session practicing pattern flying and emergency landings in your plane. These activities are designed to enable companions to be more comfortable in the flying environment. DonÂ’t hesitate, sign up while registering! The Broadmoor is the longest-running consecutive winner of both the AAA Five-Diamond and Forbes Travel Guide Five-Star awards. Since first opening in 1918, The Broadmoor has offered guests a unique way to experience the beauty of the American West, and continues that tradition through our Forbes Travel Guide Five-Star day spa as well as our restaurants (including the only Five-Star, Five-Diamond restaurant in Colorado, The Penrose Room), 54 holes of championship golf, six tennis courts, indoor/outdoor pools, distinctive retail shops, specialty tours, activities and programs for guests of all ages and interests. This year’s airport choice for the annual convention is Colorado Springs Airport (KCOS). The FBO is Cutter Aviation. EJOPA will be providing transportation from Cutter Aviation to The Broadmoor on Tuesday and Wednesday, April 30th & May 1st from 11:00am to 7:00pm. If you arrive at any other times, you are responsible for your own transportation. On Sunday, May 5th, EJOPA will again be providing complimentary transportation from the Broadmoor to Cutter Aviation from 6:30am to 11:30am. Again, if you are departing at any other times than those above, you will be responsible for your own transportation. Do I have to be a member to register? 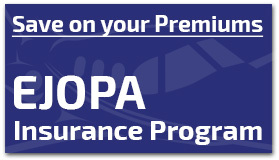 You must be an EJOPA member to register. Click here to join before registering. The registration fee covers all food and non-alcoholic beverages from Wednesday night through Sunday morning. It also includes transportation to/from the airport and hotel, seminars, etc. You should not have any extra expenses except your room, tours and shopping. Do I have to pay for my spouse or guests? The majority of the money spent on the EJOPA Convention is for food, therefore everyone must pay the registration fee. At The Broadmoor, the meal cost per person this year alone is $999.00, which is why there is no discount for family members. Do I have to pay the full convention fee if only attending a portion of the convention? It would be too difficult to come up with fees for just part of the convention. In addition, the sponsors pay a large portion of the total cost of the convention, which makes it even more difficult to come up with partial fees. What if I have to cancel after registering? If you cancel up to April 15th, you will receive a 100% refund. After April 15th, there are no refunds. Do I need to rent a car for the convention? Transportation is provided to/from the airport and hotel. If you are doing any activities on your own you may wish to rent a car through the FBO directly. When is the best time to arrive & depart the convention? You should arrive at the convention no later than Wednesday afternoon if you wish to make all the regular seminars, etc. The best time to depart is on Sunday between 6:30AM-12:00PM. The dress code is “country - club casual” for most events. Western attire is recommend for Thursday nights dinner. Will my companion/guest have planned activities? EJOPA and The Broadmoor will be offering many companion/guest activities. A companions get acquainted luncheon is scheduled for Thursday, May 2nd. We will also be offering the Eclipse Companion Flying Course ground school and in-aircraft training in your plane. Vendors can register online or download an offline vendor registration packet. Contact Bill Alberts Sr. @ 843-785-9358 with any questions.